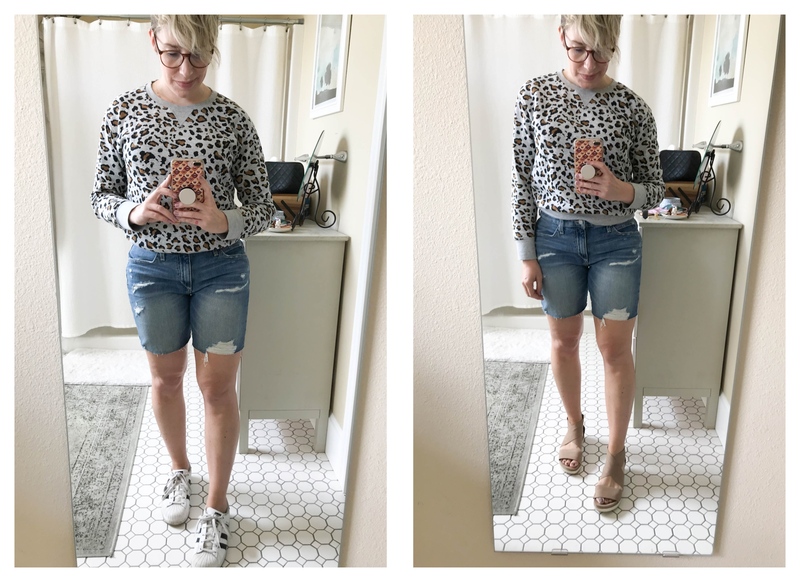 OK, well, Shana took one for the team and recently posted her failure of a bermuda shorts try-on sesh. Haha. I LOVE her candor. It’s refreshing, right? 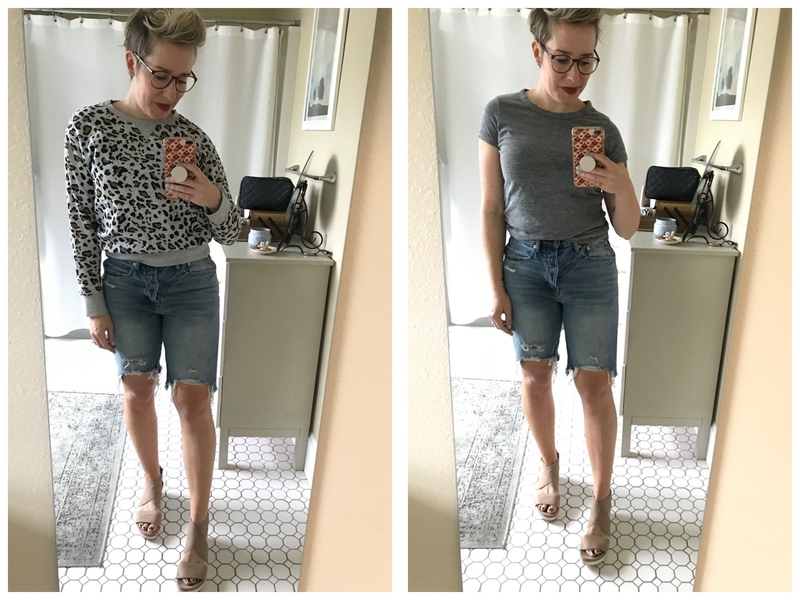 I have also been on the hunt for a longer short because, um, I just feel like this is the first summer I’m not gonna feel like rocking short cut-offs. I know…I’m OK with it though. If you are in the 40-something club and still feel like rocking them? YOU DO IT, Mama. I tried a couple on recently and was just ready to move on. AE 90’s Boyfriend Short (6) – A little long…and a little too high-rise for me so the rise falls just a bit around the button fly. But the wash on these is SPOT ON. And they still have stretch. I’m tempted to keep them anyway. A good start! 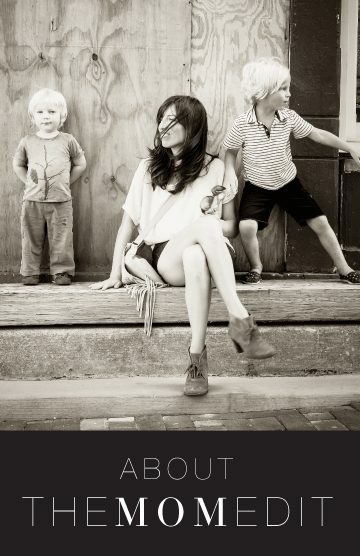 Free People Caroline Cutoff Denim Shorts (28) – For some reason I thought I should order these. Then, when I opened the package I thought I’d lost my mind, but with the gray tee…not bad! Even at that long length. I forgot to try them with another pair of shoes, but I do feel they’d work best with a skin-tone sandal. Joe’s Jeans Bermuda Jean Short (28) – Um, yeah. Not flattering. This is where we started to go downhill with this whole process…again. I think the waist or hips are too big? This is a problem I have with many pants/jeans/shorts…too big in the waist, but fitted in the legs. The wash wasn’t bad on these though. But I’m also not into extra fabric in the hips? Bye. Paige Sarah Shorts (28) – These aren’t as noticeably bad here, but in person the ‘droopy crotch’ is more noticeable. SO glad I just wrote that term down and published it on the internet. I think they have the same fit issue as the Joe’s Jeans pair. The wash wasn’t as awesome on these, but I like the minimal distressing. Levi’s 501 Long Shorts (28) – Levis. What are you doing to us? You’ve been so trustworthy for years and have created some of our favorite jeans! Maybe stick to those instead of shorts. First, Shana’s un-buttonable pair and now this. I mean WTF are those horizontal strings?? These have stretch, but they were also small even after sizing up. I guess I could have tried unrolling them like the website pic, but I honestly wanted to move on with my life so I didn’t bother with shoes, either. AE High-Waisted Tomgirl (6) – These…are good. The wash isn’t perfectly spot on like the top pair from AE, but it’s still good and fairly vintage-Levi’s-y, which is always my goal in finding faded denim. The length here is good on me and I like the distressing just at the hems. The rise is fairly high still, but not uncomfortable or droopy (thank god). I like them with both shoes, too. Whew. A winner! OK, I’m gonna go out on a limb and say we may be done trying on jean shorts for now, but at least I found one wearable pair for summer. 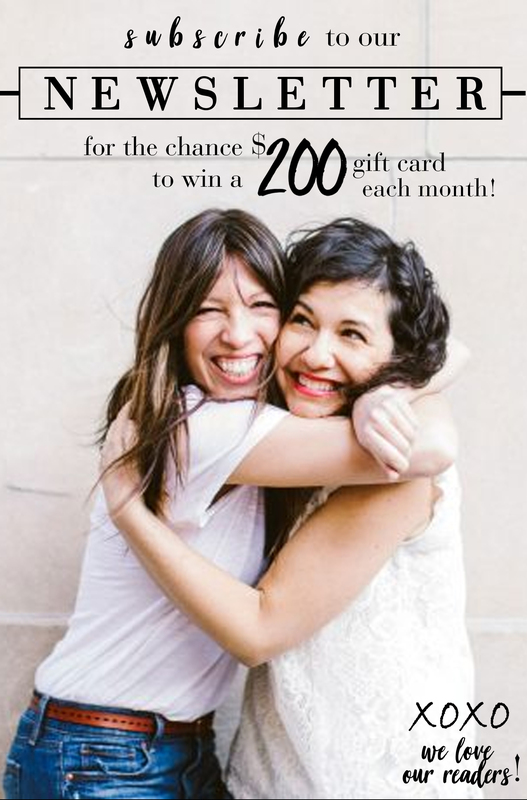 If you have any favs…please, for the love of god, send them along. Haha. Have a good week, y’all! 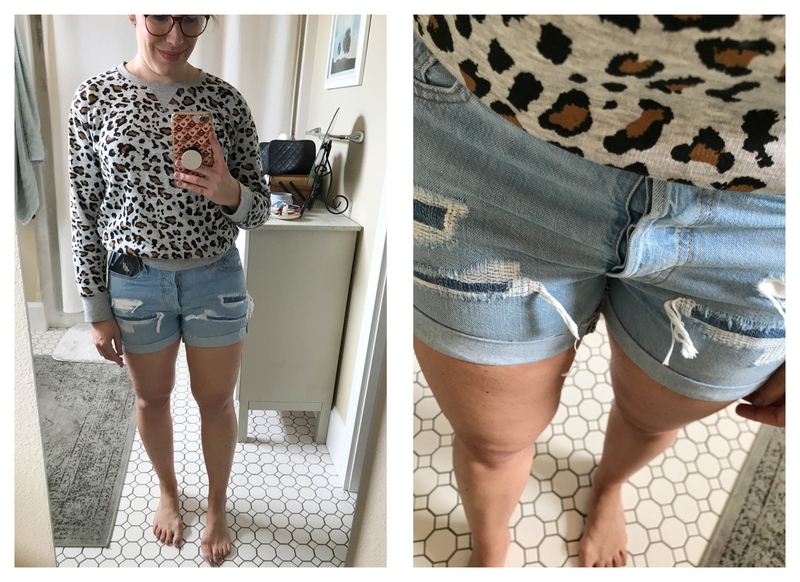 THANK YOU to you and Shana both for posting the cold, hard truth about shorts. I have recently lost 40 lbs. and have been FAILING miserably at finding shorts that don’t make me look truly horrible. I was feeling like it was just me, and now I realize it’s the shorts … or Jorts. I’ve kind of given up on shorts for summer (except maybe as coverups during some pool time). 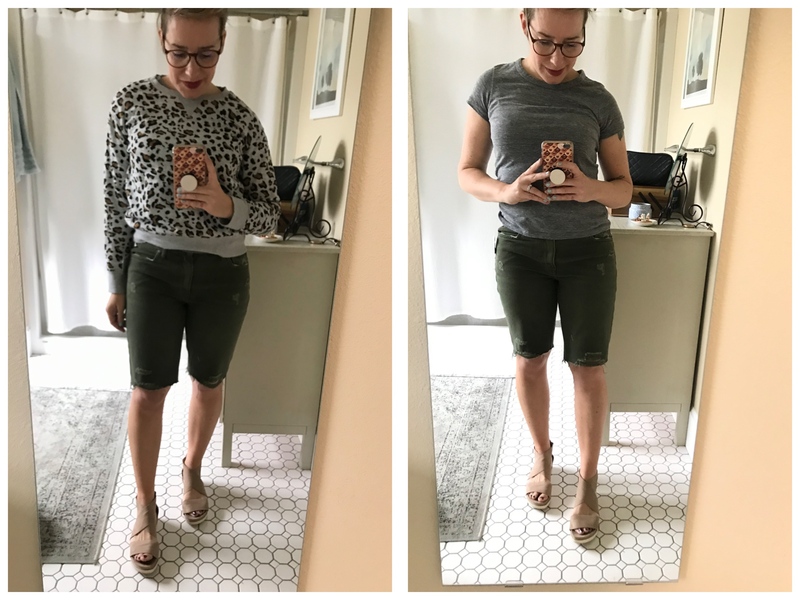 I’m in my early 40s and just can’t find a pair that fits right, feels right, and doesn’t make me feel a bit bad about my legs. I’m all in on easy dresses and skirts for summer and, if I have to, I’ll wear jeans for a night out. 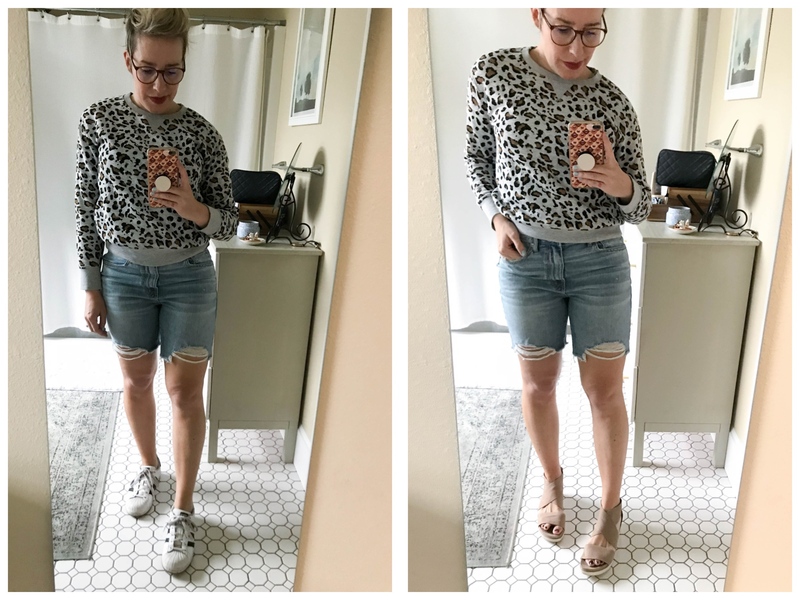 I haven’t worn shorts in YEARS and I am 100% ok with that! Truly! I like feeling confident, chic and put together, and shorts have never delivered. The green shorts you tried on are the best of the bunch. But perhaps try a long sleeve shirt/blouse fully tucked in with espadrilles? You look so cute in everything, and this post made me LOL. Also…where are your sandals from?? Thanks for all the work you did! Finding a good pair of jean shorts is hard. 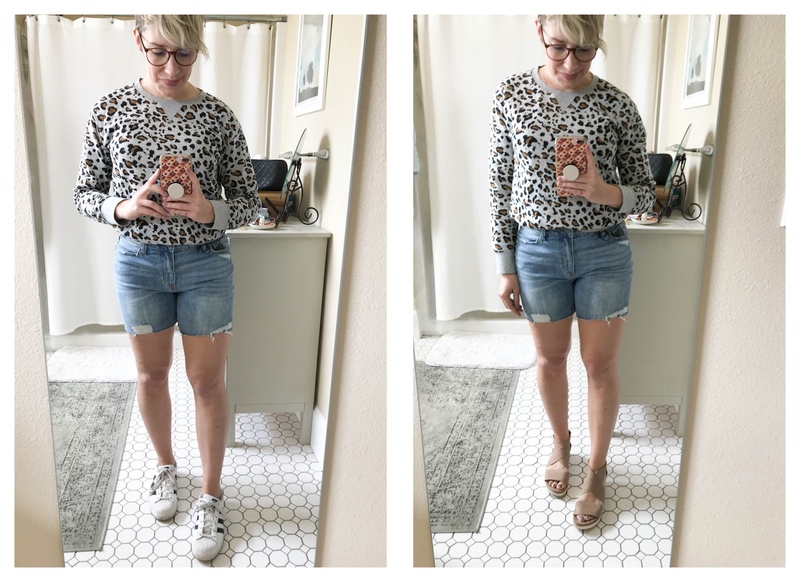 I know this wasn’t the point of your post, but would mind sharing where you got the sandals you are wearing in the pics? I really like them! Yes, can you link the sandals please! Yes! These are the sandals: https://rstyle.me/+iQJPlmlfHC7R-E4hji2Fzw I also linked to a similar pair in the comment at the end! Ok, I have NEVER had good luck with denim shorts, or shorts in general. Until I found these: https://www.amazon.com/Lucky-Brand-Womens-Short-Loreta/dp/B079NK3ZRL . Longer length, but not too long, great wash, great rise. And reasonably priced! Geez I love this😂 and also thank God I’m not the only one who is just not into shorts. Love this post and Shana’s post and “what fresh new hell is this” comment made me laugh until I cried! Haha, right?! I did the same. I’m glad we can laugh together about this. It makes it all better haha. Laura, I loved your article about what to wear when you don’t wear shorts. I bought all that stuff for my trip to Hawaii and it was great! I feel like that article needs a mention here because shorts are horrible. Thanks, Ame! I’m so glad it was helpful. You know I like trying to make challenging things work, but yeah…I’m kinda with you on the shorts front now. Haha. Hi there. I know the topic is shorts but…. Could you tell me where you bought thet sweatshirt / sweater that you’re wearing. No worries! It’s what we’re here for! I ordered a the High-rise denim short in Brixton wash item: G0272 from J. Crew and really like them the leg opening is a little wider so they’re more flattering IMO. Oh, great thank you! I will check them out!